The Garment District of Ottawa Street was invited to decorate their windows to bring attention to International Women’s Day. They were asked to use the colour yellow, and a theme that highlights women, or a women’s issue. They responded whole-heartedly and tied Ottawa St together with a yellow ribbon that spread amongst at least 60 stores. Our yellow windows campaign this year is the most successful so far! 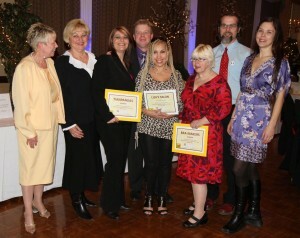 We worked with the Zonta Club of Hamilton 2 and had great support from the Ottawa St BIA., and our members. Of the 100 stores and shops on Ottawa St, at least 60 of them displayed a wide yellow ribbon in the window “tying” the street together. And of these, at least 40 shops decorated their windows in yellow, with a “women’s” theme, and displayed our poster saying “We are Celebrating International Women’s Day”. More than a dozen of our members with family and friends walked on Ottawa St on Feb 26 to judge the windows and take pictures. Two of the hairdressers, Tianpandas and Lilly’s had parties going on that day. CHCH TV was there for quite a few hours and we made the 6 oclock and 11 oclock news! A Spanish newspaper was also there and we were featured in their newspaper, and pictures are on the website (www.presencialatinamedia.com ). The event culminated on Tuesday March 8th (IWD), when some of our members, along with the BIA, Hamilton Wentworth police, and Cable 14 visited every store on Ottawa St. We handed out almost 300 yellow roses, bookmarks with information about IWD and Zonta, and yellow emery boards to the women on the street and in the shops. Then that evening, the winners attended the 100 Anniversary of IWD gala dinner at Carmen’s, where they were presented with their certificates. To see a slideshow of most of the windows, click here.